The weather was a lot better today, I was well rested and was on the road by 0900. Furkan helped me down his stairs and back up the stairs to the street. I am now very aware that my back flares up when carrying the bike up and down stairs. Juri had told me he was doing 150 or more km a day on this road from here to the border . Some 10km out of town it was evident my rear tyre had a slow leak. This needed to be seen to. Once a gas station was arrived at, I pulled in to their air station and carried out the necessary repairs. A container of water was needed to find the tiny leak. The German Rema Tip Top patches and glue make puncture repairs so easy. They are brilliant at bonding onto the tube. The riding was indeed easy and enjoyable on the dual lane coastal highway. Tunnels were still common. Though well lit, I always put my rear light on if they are over 1km in length. The road was flat almost all day with only slight rises here and there. It was always vey close to the Black Sea. 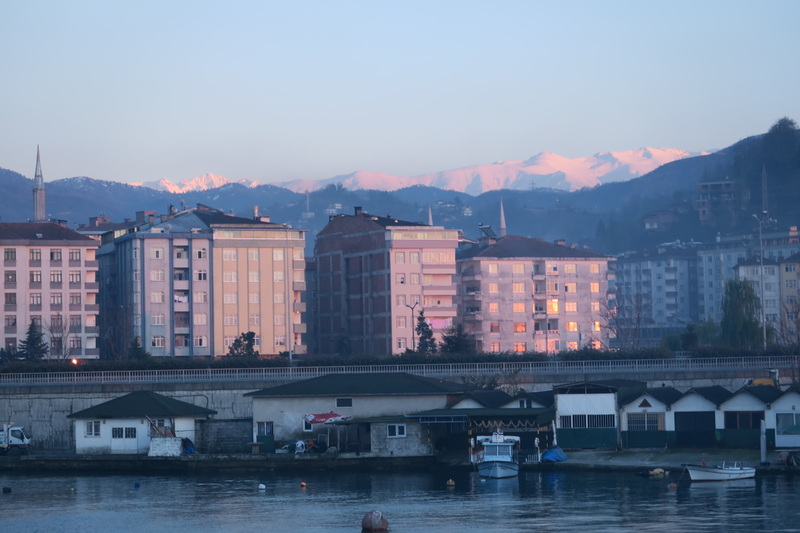 The Kackar Daglari snow clad ranges could be seen for most of the way. 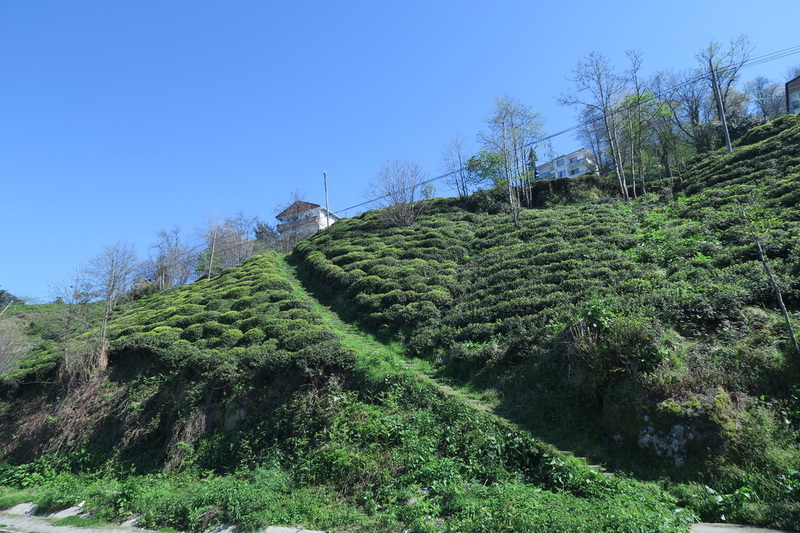 There was now cay growing on every available space on the coastal slopes adjacent to the Black Sea. There is indeed a micro climate here. Those snow clad ranges were very close. Though their cold air must just flow over the top here at high altitude. Traffic had lightened up, the problem was barriers everywhere on the road. It was quite an exercise walking across the road to take better photos. Some photos were taken from the pedestrian walk over bridges. These offered great uninterrupted views. Interestingly unlike in our country there is no need to have mesh over these walkways. People have better things to do than throw objects onto traffic below. This need at home must add so much money to the construction of these walkways. The pace of modern societies leaves many behind, some of those people need to express their dissatisfaction with their place in the community by endangering and on some occasions harming others this way . On arrival in Cayeli I was totally worn out but felt great. I met another local cyclist in town who took me to a few hotels but all were too expensive for me. I finally settled on the Hote Cayeli, a budget place with lots of stairs. It was needed as camping is difficult on this urbanised road. A huge dinner was eaten and a phone battery bought in Ethiopia was replaced . Tomorrows ride was another 100 plus affair so plenty was eaten. Before dinner a walk was taken to the water front. Here a magic sunset was experienced. It was a fantastic evening to be my last in Turkey. 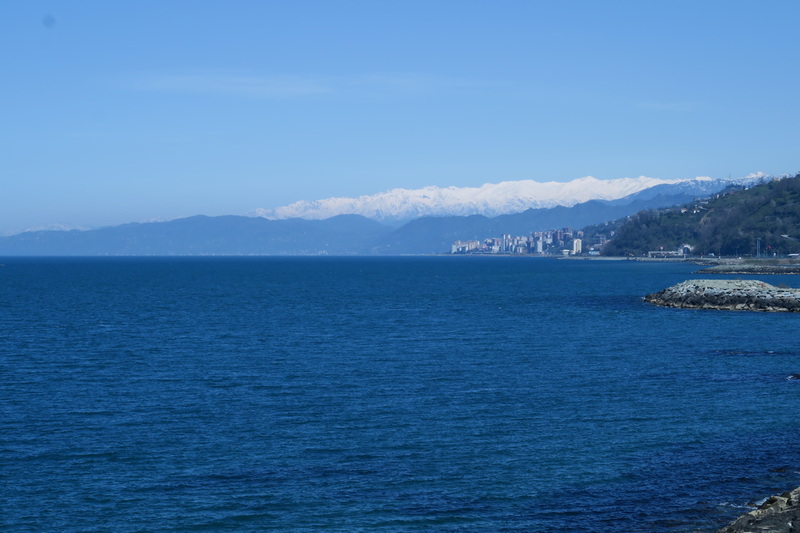 The mountain range covered in snow was also visible from the water front. The evening was reasonably mild however . Though nearly a dollar, a banana was bought to satisfy my addiction to these wonderful fruit . It took no time to fall asleep in the cool but comfy little second floor room. There was a person with the worst of coughs in the room next door. His fits actually put me to sleep. I was up early and keen to get to Georgia. It is always exciting arriving in a new country, often with a new culture. I always take my ger down the stairs in stages so as to always have it in sight . This is one situation where things can get stolen. One can not go door knocking and accusing people in the hotel if something does get stolen .On the road I bought bread, my last. The day was slightly overcast but very mild. The day was interrupted with the need to stop and put my rear light on to ride through the many tunnels. A great chicken salad lunch was enjoyed in Findikli. The sea was like a mill pond, it really was a beautiful day. The temperature was increasing all the time. In the end I was down to my tee shirt and put my peak hat on it was that warm . I was in Hopa by about 1300. This was a town where Georgians were wandering the streets buying clothing from the many stalls. It was a typical border type town with wheelers and dealers everywhere. I kept going and in another 30km done quickly was in Sarpi. Here at the border. They directed to the head of traffic. My first job was to be stamped out of Turkey. Then I had to claim my tax back on some bike parts bought at Biciklet Gezgini in Istanbul. This was easy also. Then I walked with my bike through a long white hallway to the Georgian immigration. There was no problems here. This was one of the most hassle free border crossings I have ever encountered, and it cost nothing. Into Georgia I stopped at the tourist desk. An hour was spent here with the two girls who were so helpful. One of them walked with me to a vending machine to put credit on my Geocell sim card that was complimentary from their desk. 2Gb was only about $5 for a month. We had lots of laughs together. They really were great . I was online in no time again. Leaving here, a huge Georgian flag was flying and 500m down the still coastal road was a little stone Christian church. Trucks were lined up for a kilometre waiting to get through the border .It was 10km into Batumi. The road was a little less maintained. I like rough roads they keep one occupied dodging the various obstacles. People as usual were friendly. It was great to see cows just wandering amongst traffic on the way into Batumi. I took the turnoff and rode the foreshore bike track into the exciting looking town. There were old soviet era apartments on the coast. Just as many cranes were building new apartments. I stopped in the city and had a huge meal at a very reasonably priced modern eatery. Traffic was everywhere, doing many things outside the required. Again this kind of thing does not bother me. One just has to be a bit more vigilant proceeding. By the the time my meal was finished it was raining outside. Some bananas were bought. It was becoming evident things were cheaper here than in Turkey. Consumables anyway. Bananas were a third cheaper ,great. Jur I had given me coordinates to a hostel. .On arrival here it was found out be to costly for a private room . I went down the road in this old area of Batumi and found a great place, The Globus for half the price for a great private room. I was quite wet by now. It was great to be indoors. It was another big day. 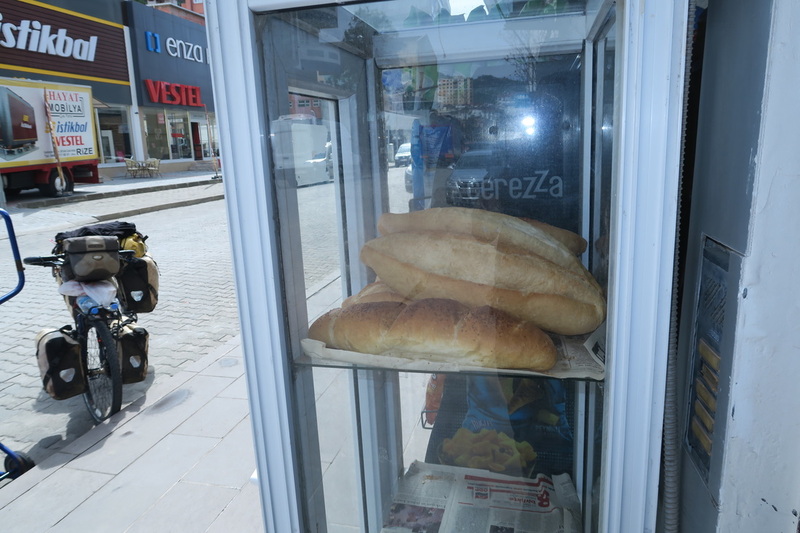 I am going to miss this fantastic Turkish bread.